Six, that's right, only six people signed up ObamaCare on the first day of enrollment. You can fit six people in most folks' living rooms. They were with BlueCross BlueShield North Carolina and Kansas City, CareSource and Healthcare Service Corporation. By Wednesday afternoon, enrollments were up to "approximately 100." By the end of Wednesday, the notes reflect "248 enrollments" nationwide. Since October 1, the Obama regime has said that they don't know how many people have enrolled in ObamaCare. CBS got wind of the rotten sign-up figures after the House Oversight Committee requested documents from the Department of Health and Human Services. Obama lied--repeatedly--about ObamaCare, his so-called signature achievement. Yesterday a bust of Winston Churchill was dedicated inside the US Capitol. Watch as John Boehner introduces Roger Daltrey, who sings "Stand by Me." (Video) Sebelius on if Obama is responsible for ObamaCare debacle: "Whatever"
Obama's inept HHS secretary, Kathleen Sebelius, wouldn't answer questions from Rep. Greg Harper (R-MS) about whether the president was responsible for the ObamaCare fiasco during her House testimony today. She ended with "whatever." While running through Morton Grove's St. Paul Woods yesterday morning, I encountered a coyote and a Cooper's Hawk. 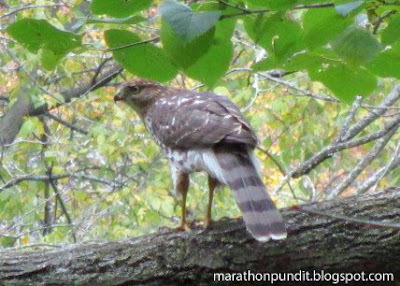 I didn't get a picture of the first one, but I did capture one of the hawk. Obama lied and your healthcare plan died. As you will see in this video, he repeatedly lied about it. Two hours ago CNN reported that as HHS Secretary Kathleen Sebelius was testifying in front of a House committee, the ObamaCare website was down. This is the message I get when I click to enroll. While answering questions from Rep. Lee Terry (R-NE) during House testimony about enrollment data, embattled Health and Human Services secretary Kathleen Sebelius replied, "The system isn't functioning, so we are not getting that reliable data." As I write this entry national joke Kathleen Sebelius, Obama's Health and Human Resources secretary, is testifying at the House of Representative. Watch here as she admits to Rep. Mike Rogers (R-MI) that she doesn't know if the inoperable ObamaCare web site code has been tested end-to-end. Do you want to enter her Social Security number on that site?